We'll get a better idea of what the Fed thinks on Thursday after the market closes, when the bank regulator releases the final results of its stress tests. The preliminary results suggest Goldman could lose $25 billion from bad trades in another financial crisis, more than any other bank tested by the Fed. Goldman's (GS) potential trading losses were more than double what the Fed saw possible at Goldman's closest rival, Morgan Stanley (MS). The Fed put Morgan's trading risk at just under $12 billion. Only JPMorgan Chase (JPM) came close. The Fed estimated that Jamie Dimon's bank could have $23.5 billion in losses. Goldman declined to comment on the stress tests. In the past, CEO Lloyd Blankfein has said that the firm closed its proprietary trading operations. 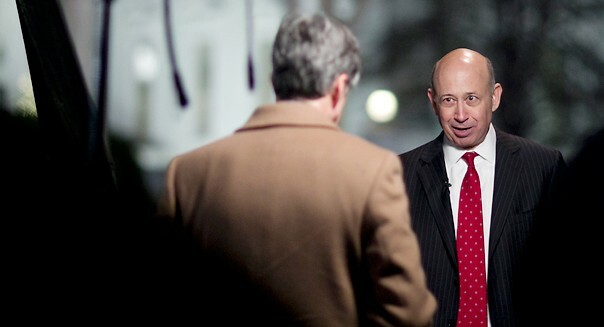 Recently, both Blankfein and Goldman COO Gary Cohn have been warning about a bond bubble. In its recently filed annual report, Goldman said that in 2012 the amount it risked in the market -- i.e. the maximum amount it could lose -- on average per day was $86 million, down 60% from what it was back in 2009. But the Fed seems to think the risk in Goldman's trading book hasn't dropped nearly as much as the bank says. By Goldman's risk estimate it would take the firm 290 trading days to lose the nearly $25 billion that the Fed suggests it could in a downturn. But the bulk of the estimated trading losses in the Fed's stress test, which tracks how the banks would do in an economic downturn that hypothetically started last October and runs through next year, are expected to take place by the end of 2013. That leaves Goldman a few days shy of its ability to get to the Fed's dubious goal, even if it were to lose $86 million -- the maximum it says it could lose -- everyday for more than a year. Morgan Stanley, by comparison, would reach its Fed loss mark in just over 160 days based on its estimates of the risk its trading desk took in 2012. Citigroup (C) would get to its allotted trading loss in 107 days. This is of course not really how things would work. Even during the financial crisis most firms didn't lose money trading every single day. Wall Street analysts have long taken these estimates of how much a firm's trading desk could lose with a grain of salt. Behind the scenes the so-called value-at-risk measure is one of the least trusted on Wall Street. And that's saying something. Most people believe VARs would spike in another financial crisis. Still, the stress test points out just how far off the main figure of risk that banks, but Goldman in particular, reports to its shareholders must be. What's more, Goldman's VAR doesn't include any losses it could have on the nearly $4 billion in long-term investments the firm has made through its own private equity and debt funds. But even if all those investments went to zero, it would still have to lose another $21 billion. Even that amount would take 244 days. Morgan Stanley analyst Betsey Graseck estimates that Goldman's potential trading losses and its poor showing in general in the stress tests means the firm may be forced to cut the amount it was expected to spend in share buybacks next year by a third to $4 billion. If that is indeed what the Fed says on Thursday afternoon, investors should do more than mourn the lost buybacks. They may want to question just how much Goldman, and Wall Street in general, has really changed.